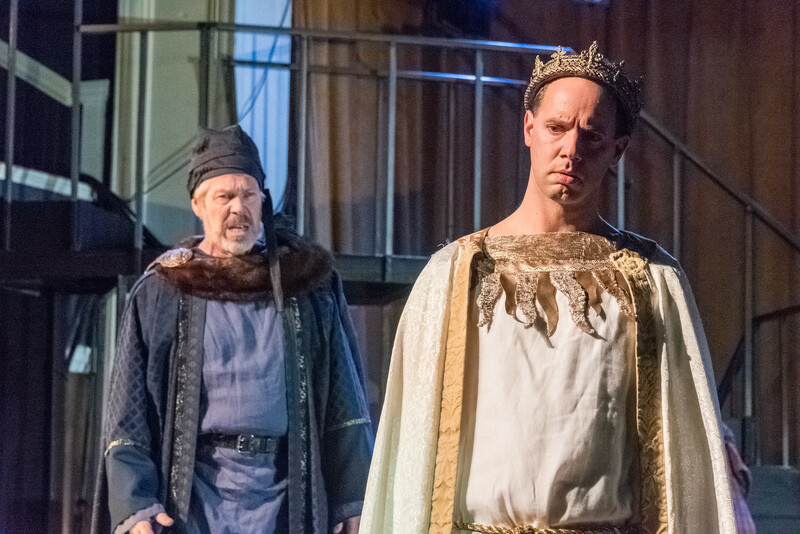 CAMBRIDGE – It is the political season – would that it weren’t – and thus a fine time for Actors Shakespeare Project to delve into the politics of Britain in the late 14th and early 15th Centuries in Shakespeare’s “Richard II” at the Cambridge YMCA through March 13. “Richard II” is one of Shakespeare’s history plays that also plays as a tragedy given its ending, and is usually counted as part of a package that also includes the “Heneries,” as Peter Noone of Herman’s Hermits liked to call them, that will follow: “Henry IV, Parts 1 and 2,” “Henry V,” and “Henry VI, Parts 1, 2 and 3,” respectively. 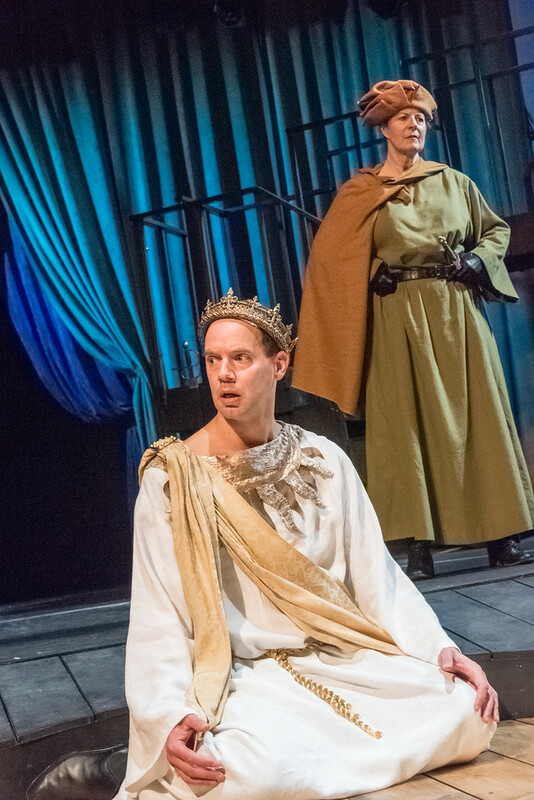 In this time of great political upheaval, “Richard II” reminds us of what can happen when a monarch unjustly oversteps his bounds, thereby losing his right – at least in the eyes of many of his subjects – to continue to reign. There’s action aplenty in “Richard II” with disagreements, deaths, wars, imprisonments, and a deposition, to name just a few of the events. Just another day in the life of the British monarchy of the day. “Richard II” deals with only the last two years of the monarch’s reign, from 1398-1400. The ASP production begins with the violent death of the Duke of Gloucester, setting the stage for what is to come. Doug Lockwood as Richard is an imposing figure, tall and fit, emerging from an onstage bath to referee a political scandal that has landed squarely in his lap – shouts of treason and accusations hurled back-and-forth after the death of the Duke of Gloucester, the opponents two subjects loyal to him: His cousin Henry Bolingbroke (Michael Forden Walker), later to become Henry IV, and Thomas de Mowbray (Lewis Wheeler), the Duke of Norfolk. Richard is flummoxed and hesitant about what to do in the dispute, as the two up the ante and threaten to solve it via a duel. Just as swords are about to be drawn and blood shed, Henry is banished from the kingdom by his cousin Richard for ten years – later shortened to six years. After his father’s death, Henry’s family’s fortune will be seized by the king to fund a war in Ireland, setting the stage for Henry to rise up against Richard. As Richard, Lockwood has his best moments early and late, especially as he prepares to hand the crown over to Henry and while he contemplates his fall in the Tower of London, bewildered at his fate, and pondering how it might have been otherwise. And while Lockwood cuts a dashing figure as Richard and Walker is just fine, the best of the performances come from Wheeler, Malcolm Ingram and Robert Walsh. Wheeler as the Duke of Norfolk not only rejects the blame assigned him by Henry, but doubles down in his rhetoric against Bolingbroke, and then speaks movingly and elegantly after Richard imposes a lifetime banishment; Wheeler will later return as a wistful gardener and a spirited Welsh captain. Ingram is a weary warrior as Richard’s uncle John of Gaunt, who lets Richard have it on his way out the door, while Robert Walsh, coming off a splendid season as artistic director at the Gloucester Stage Company, is the wise and wizened Duke of York, doing his best to protect his nephew Richard from his own excesses. There is nary a weak link in the cast. Paula Plum can and has done just about everything for ASP, and here she shows the toll the events take and the anguish felt by Richard’s spouse Isabella, and then in a cross-gender role becomes the murderous Duke of Aumerle, while Marya Lowry also moves easily from the Duchess of York to the the Earl of Northumberland. As an aside, as a theatrical troupe, the great advantage the members of the Actors Shakespeare Project have is that they are so familiar with the rhythms, cadence and structure of The Bard’s prose that their performances flow freely and naturally, in contrast to the somewhat stilted efforts of actors who don’t do Shakespeare often. Thus the company members speak their parts clearly and surely, and the benefit for the audience is dialogue that crackles and sings. This marks the fourth time ASP has visited the intimate space in the Cambridge YMCA that has the actors entering and exiting among us. At times they seem to be speaking right to us while making their arguments, almost as if they were pleading for our votes, as all around us the political machinations around the deposing of Richard and the ascension of King Henry IV go on. The ASP design team does its usual fine work. Janie E. Howland makes good use of the upper level of the space with two stairways going up and down from the thrust stage, the lighting by Daniel H. Jentzen is appropriate to the changes in mood, Arshan Gailus’ sound and original music reinforce the nuances and subtleties of the piece, and IRNE Award-winning costume designer Tyler Kinney weaves his magic again with some gorgeous costuming. ASP Artistic Director Allyn Burrows steers the ship with a sure hand , and the result is a polished production that makes the play – not exactly noted for its flowery prose or memorable monologues – powerful and gripping theater.